Bug fix: Include file name in content searching could not be switched OFF. Bug fix: Accepting single-quotes in XML UTF declaration. Bug fix: Missing installation file for x64. Bug fix: *. * not matching ALL items. Bug fix: Browse for folder not including current path. Bug fix: Installation issues on some computers (installer was leaving just a single InstallIssue.txt file). Bug fix: Double-click column header divider to auto size. Bug fix: Registration code crash. Windows 8.x related minor fixes/improvements. Browse for folders limit bug. Added thread configuration option to switch off multi-threading. Fix: Focus issue with Ctrl + A on file list. Fix: PDF not working on some machines. Fix: Crash in Basic view if search with containing text checked but no text entered. Boolean expressions (AND, OR, NOT). Supports popular office formats including Office 2007 and OpenOffice. Available in both 32-bit and 64-bit versions. ‘FileLocator Lite’ alternative branding for corporate environments. New context menu features, such as Explore Here. Modernization of the User Interface. Copy acting as Cut on certain versions of Windows 98 (thanks to Kasauli for reporting bug and testing fix). Executable unnecessarily linked against oleacc.dll (Win 95/NT does not install this Active Accessibility support DLL). WinXP shell extension bug fix. 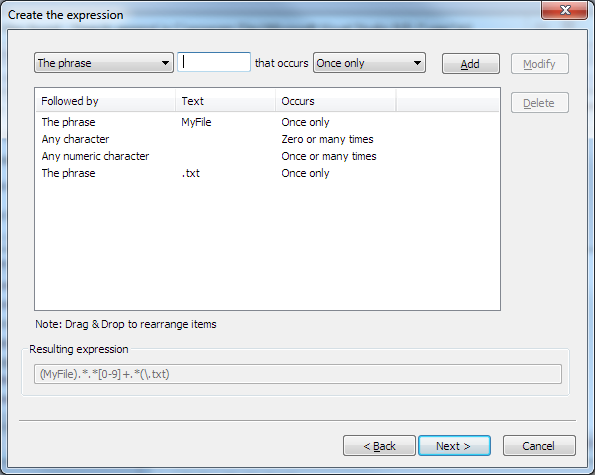 Expression Wizard bug. Not correctly handling a couple of expression types (reported by Robert McAllester). Now using ShellExecuteEx instead of ShellExecute. Fixed inconsistent behaviour with WinNT. Fixed problem with saving results to clipboard (reported by Mike Stewart). Fixed major memory leak problem. Command line ‘-o’ option now streams directly to output file allowing unlimited search result sizes. Fixed bug in non-string command line switches (thanks to Jody Adair for pointing it out). Options settings not being remembered, fixed. 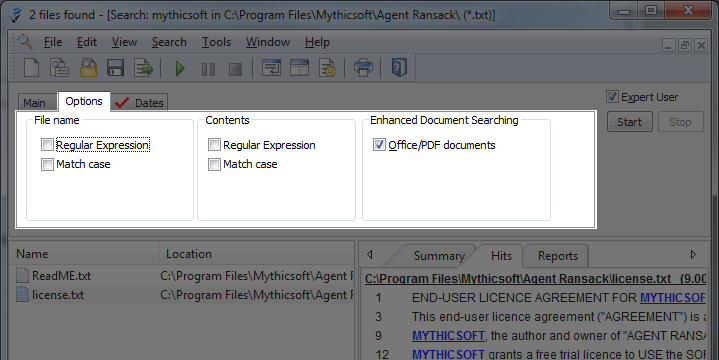 Match case on contents searching not working correctly, fixed. Ability to search multiple folders. Ability to specify Unix (LF) and Mac (CR) as valid EOL markers (accessed through Configuration menu). Context menu support for multiple file selections (e.g. copy and delete multiple files). Ability to clear drop down list history added. No longer filters out foreign characters (i.e. allows anything over ASCII 32). Installation is now self-contained EXE (sorry it’s taken so long). Keyboard accelerator problem fixed (e.g. Ctrl + N etc.) and added Ctrl + A for Select All. Keyboard shortcuts added for dialogs (e.g. Alt + N for filename). More responsive to Cancel Search, especially when searching large files. Better validation when restoring Window to saved position and size. Better support for font size changes. 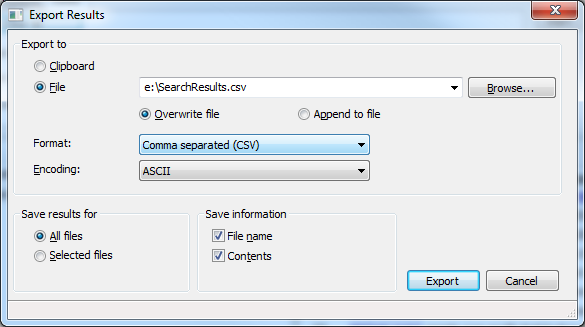 Ability to save results (file names and/or contents) to a file or the clipboard. Shell extensions. 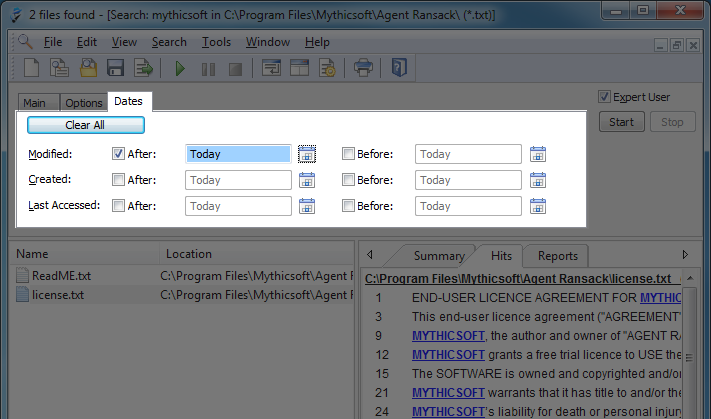 Agent Ransack adds itself to the context menu for folders and the Find menu. One Phase Searching option to allow for more efficient contents searching of large drives (disables progress meter). Command line parameter to perform search without GUI and output results to a file (AgentRansack.exe -h to see all parms). Access to folder denied Stack Fault bug fix (mainly a problem with Network drives). Better support for non-English language characters. Truncates lines that are over 5,000 characters. Supports DOS expression ‘;’ for specifying multiple file names. Fixed “Abnormal program termination” on bad files bug (uncaught exception). Remember window size, position & font. Added support for different Windows font sizes (e.g. Large fonts). 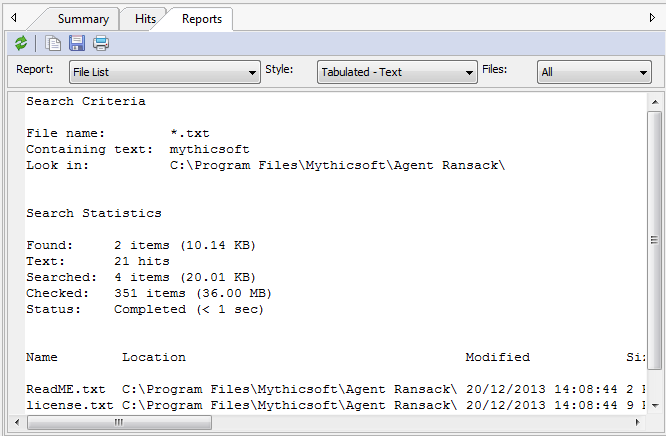 Added additional file list view columns: Size, Modified, Type. Added sort functionality to file list view. Added ability to ‘Remember’ options. Fixed interpretation of ‘&’ bug in Contents view. Folder drop down speeded up. 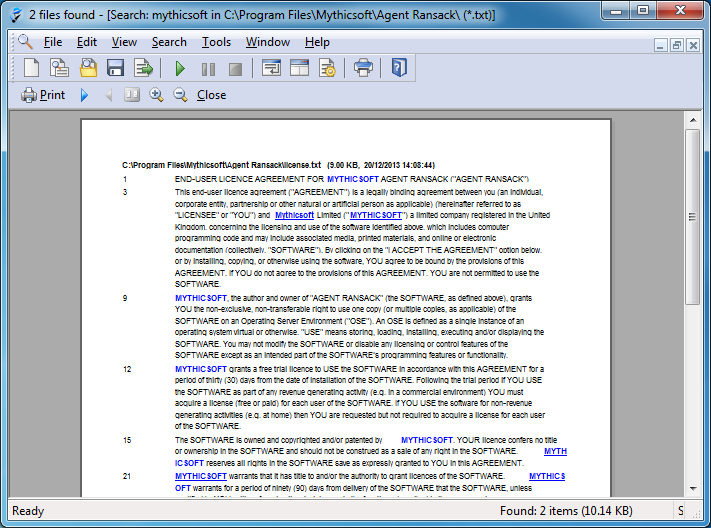 Basic Search Wizard examples reworded. Error message when listing directory history if not connected to network and history includes a networked drive. – Did not fully validate search directory name. What's the difference between Agent Ransack and FileLocator Lite? FileLocator Lite and Agent Ransack are built from the exact same source code and therefore offer exactly the same functionality. The only differences are cosmetic, ie different names and icons. Why the two different versions? Agent Ransack is the original name and widely known and liked by many people. 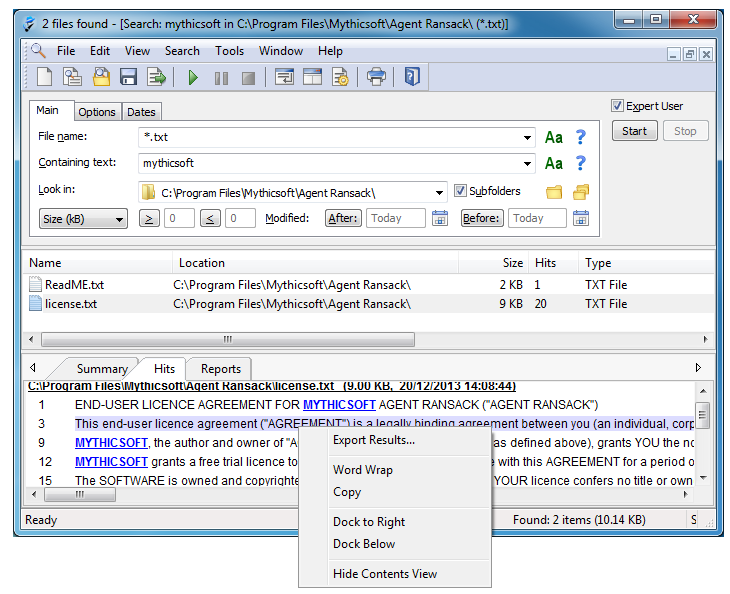 However, the name Agent Ransack appears to be a bit too ‘aggressive’ for many corporations hence the gentler sounding FileLocator Lite. VGA (800×600) or higher resolution monitor with 256 colors.